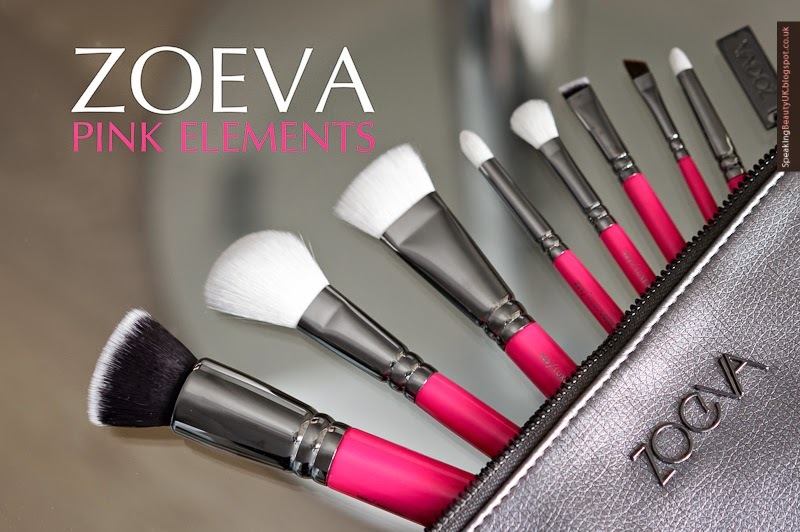 I already owned a couple of Zoeva Brushes, including the popular 227 (dupe for the Mac 217) and loved them so I was super excited to find this Zoeva Pink Elements Classic Set under my Christmas Tree last year. This set is amazing and it's got pretty much all the brushes you'd need on the go. It comes with 3 face brushes, 5 eye brushes and a faux leather pouch that is big enough to carry around more brushes, if needed, or makeup. Zoeva's quality is of high end brushes. They look beautiful with wooden pink handles & gunmetal details and the bristles are incredibly soft and don't shed at all. At least that has been my experience with Zoeva so far. 1st up is the #104 Buffer Brush. This brush is one of my favourites of the bunch. It's so so soft on the skin and quite dense too. The perfect foundation brush for a flawless look. Second one and another favourite is the #109 Luxe Face Paint Brush, which is one of the reasons I was so excited about getting this set. I love this contouring brush. It gives such a precise finish. It makes contouring so easy, even a beginner would be great at it. #127 Luxe Sheer Cheek Brush is a conventional angled blush brush. Not too dense which means I can apply blush very sheer and build it up to my preference. I also use it to apply bronzer all over the face, when I don't want to do contouring. #227 Luxe Soft Definer Brush is one of my all time favourite brushes. This is the perfect blending brush and in my opinion better than the Mac 217. It's fluffier and denser, allowing me to pack the right amount of colour and blend it on my crease perfectly. #230 Luxe Pencil Brush is the ideal brush for smoking eyeshadow under the eyes, smudging eyeliner or adding some highlighter to the inner corner. I feel it'd do the job better if it was a little smaller, but it's still a great brush. #231 Luxe Petit Crease Brush is a new brush to my collection. The name says it all. It's a blending brush for those with a small crease or to just add more detail to the crease. #317 Wing Liner Brush is a synthetic, slim liner brush. It can also be used for eyebrows. Lastly, we have the #322 Brow Liner Brush, which is a much bigger, thicker and denser angled brush, designed for the brows. It's great and I find it packs a good amount of product, making application quick and easy. The only thing I think is missing in this set is a highlighter brush. But overall I'm in love with the Zoeva Pink Elements Classic Set. It retails for £56.95 (here). I think it's a brilliant value for 8 brushes + a makeup bag. But if you can't afford the set or don't need a set like this at the moment, you can still buy the brushes separately. They are amazing and I would definitely recommend investing on them.